The list of nominees for the prestigious AFRIMMA has been unveiled with 5 Cameroonian artists Stanley Enow, Gasha, Sine; Lady Ponce and Dencia clinching nominations. The highly anticipated show which exposes African musical artistry AFRIMMA shall take place in Dallas , USA on Saturday 26th July 2014. African Muzik Magazine & AFRIMMA’s primary purpose is to cross boundaries with music. The sound of Africa is diverse, and has garnered an international appeal. This event serves as an opportunity for us to celebrate the top African Acts and the contributions they have made in relation to the African culture and sound through their music. 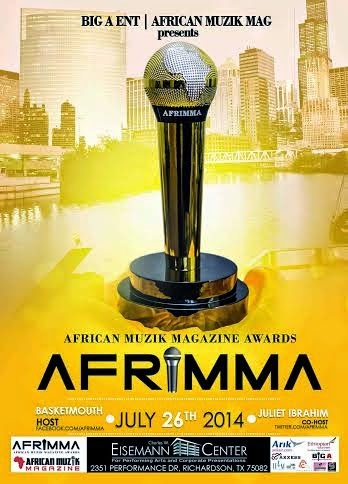 AFRIMMA will be hosted by Africa’s #1 Comedian, Basket Mouth and Nollywood/ Ghollywood sensation, Juliet Ibrahim. Confirmed Guests: 2Face, Diamond Platnumz, Stanley Enow, Davido, Flavour, Kcee, Navio, TooFan, Wyre, Timaya, Les Nubians, Fally Ipupa, Bracket, Iyanya, Miriam Chemmoss,, DJ Arafat , J. Martins and many more.